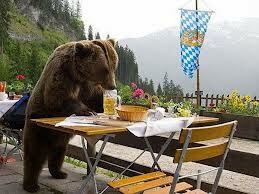 Bears Break Into Cabin & Drink 100 Beers. Hic. A brown bear and her cubs break into a secluded family holiday home in Norway, eating and drinking everything in sight. A mother bear and her three cubs broke into the wooden lodge in the north of the country by ripping off a wall, according to Norway’s Finnmarken newspaper, and went on to eat and drink nearly all its contents. The cabin’s owner, Even Borthen Nilsen, told reporters that over 100 cans of Norwegian beer – stored in the hut in preparation for the autumn hunting season – had disappeared. Bear excrement and footprints – and an awful stench – left him in no doubt that it was the animals that had trashed the place during a night of revelry. The carnage was discovered by Mr Borthen Nilsen’s mother and grandmother when they returned to the family-owned 26-square foot hut in Jarfjord in Finnmarken.